In all of my deep thoughts lately I have lost focus on my purpose in beginning this whole blogging adventure. I had not been very successful at spending time in my studio. 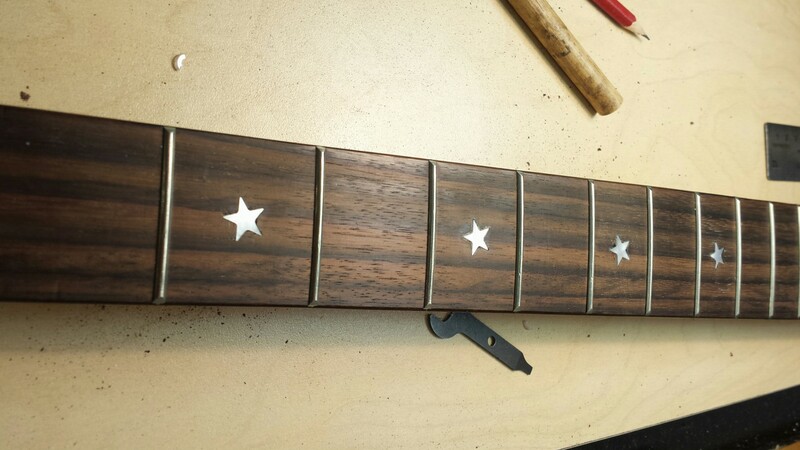 So, Sunday I for went the usual veg out evening and decided to put some time in working on the next guitar. I know it was Mother’s Day. I can hear you thinking the vegging out thing more fitting but not me. Even the most physically demanding tasks in a creative adventure are relaxing to me. One rainy September 13, 1814, British warships sent a downpour of shells and rockets onto Fort McHenry in Baltimore Harbor, relentlessly pounding the American fort for 25 hours. The bombardment, known as the Battle of Baltimore, came only weeks after the British had attacked Washington, D.C., burning the Capitol, the Treasury and the President’s house. It was another chapter in the ongoing War of 1812. A week earlier, Francis Scott Key, a 35-year-old American lawyer, had boarded the flagship of the British fleet on the Chesapeake Bay in hopes of persuading the British to release a friend who had recently been arrested. Key’s tactics were successful, but because he and his companions had gained knowledge of the impending attack on Baltimore, the British did not let them go. They allowed the Americans to return to their own vessel but continued guarding them. Under their scrutiny, Key watched on September 13 as the barrage of Fort McHenry began eight miles away. “It seemed as though mother earth had opened and was vomiting shot and shell in a sheet of fire and brimstone,” Key wrote later. But when darkness arrived, Key saw only red erupting in the night sky. Given the scale of the attack, he was certain the British would win. The hours passed slowly, but in the clearing smoke of “the dawn’s early light” on September 14, he saw the American flag—not the British Union Jack—flying over the fort, announcing an American victory. Next time you see the flag flying try not to think of all of the turmoil surrounding the USA; the riots, the political games, the negative media propaganda. Instead remind yourself of the freedoms we have been granted. I once saw a Facebook post that was riddled with obscenities trashing the government and it’s military. It was extremely abusive to veterans. I chose not to reply but I wanted to say, as a veteran, “You are welcome”. Our government and military just gave you the right to say those things publicly. It takes Courage and Freedom to say what needs to be or not to be said. A courageous freedom. This entry was posted in artist and tagged art, artist, courage, focus, freedom, guitar, history, inlays, patriotic by Young At Art. Bookmark the permalink.